Electric Eels is the next track from Space Cowboys Under the Sea of Japan that we’re looking at. This is another one of those random ideas that sprouted into a full track. Three basses at some parts. No real lead guitars. Weird lyrics that at first listen don’t seem to make sense. I tried to make them seem odd but (with any luck) if the idea is explained then the words start to come alive. It’s really an anti-consumerism song. About how everyone at some point is drawn into the thrill of buying stuff that is not important at the end of the day. How we put significance on things and objects and forget that there are people on this planet who have far less than ourselves and that if we took time to remember this then perhaps we wouldn’t feel frustrated that we don’t have an iPhone 26 or a BMW M62. Musically this is the first (and only) track that we used my bass multi effects on. There is an over drive noise, a bit distortion and a didgeridoo simulator(?) in there. Also, we used the bass effects for some lo-fi vocals as well. Which I love! The drum patterns have some nice little noises and oddness about them. There some phased clean guitar on here (I think it’s the Dot I’m playing. Rob kept a log of which instruments were used for each track). Everything ties together really well. Weird song that is totally out of our usual spectrum, but works perfectly. 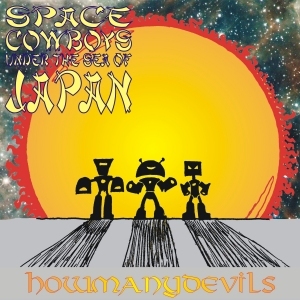 This entry was posted in Space Cowboys Under The Sea Of Japan and tagged bass, Big Bottom, Electric Eels, electronic, electronic rock, electronica, HMD, HowManyDevils, Rock, SCUTSOJ, Space Cowboys Under The Sea Of Japan, Spinal Tap, Three Bass. Bookmark the permalink.